Reality TV Show ´Being Bahati´ has sure revealed what goes on in the Palace with the most recent revelation being Diana Marua´s new TV show. In an episode of Bahati´s Reality TV show, Diana reveals she is seeking to have her on Talk Show that will focus on Fashion and Lifestyle. During the ´Being Bahati´ show, Diana Marua poses a question to the father of her daughter: You remember what I was filming? And Bahati tells us it all: The talk show? Diana on the other hand, confirms the speculations and even discloses how far it is now: Yea the talk show, so far nimefanya 3 episodes. Away from the scene of crime, Bahati explains: My wife has this interesting show that is coming up. A show that will look more into Fashion and Lifestyle. Diana Marua also revealed that having her own TV show, didn´t mean, the Gospel artist wouldn´t feature in it and this is why: The reason why I want Bahati to appear on my talk show is that he has a huge background story that resonates with many people. For the update, the model and mother of 2 seems to be going big into this industry not forgetting her role at M Waks Kenya, as its brand ambassador. M Waks Kenya is a company dealing with the hiring and vetting of blue-collar workers, just by the click of a button. 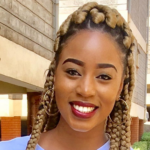 The post Diana Marua also set to start her own TV Talk show and this is Bahati´s reaction appeared first on Ghafla! Kenya.